Harvest period: selected harvesting by hand takes place at the end of October o, “brunello” clone. Vinification and aging: Fermentation takes place in stainless steel tanks at a controlled temperature (20-30°C). Spontaneous fermentation due to wild yeasts and a medium-long term maceration of the grape skins. Ageing 24 months in brand-new French oak tonneaux and barriques. Tasting notes: “Sesterzo” is our top wine and it continues to improve. It’s a single-vineyard wine from the most suitable area of the Orcia Doc, called “zona della Ripa”. 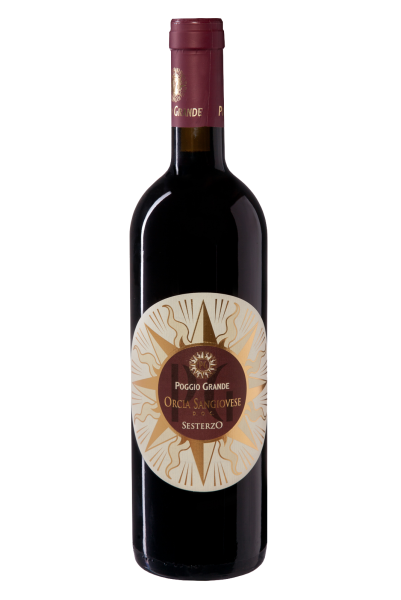 It has notes of ripe cherry, dry plum, tobacco and white chocolate with smooth elegant tannins. In the mouth its vibrant acidity appeals to those with a preference for the traditional Tuscan Sangiovese. Although Sesterzo is ready to drink it deserves to be refined in the bottle to achieve its maximum expression. Extended ageing brings out complexity and soft, supple tannins along with delightful fruit and spice that linger on. Serve with: pasta with meat sauce, game, roast and braised red meat, mature cheese.